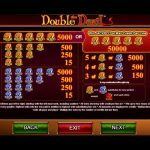 Double the Devil is a video slot game from Amaya Gaming that is inspired by the many beliefs of the concept of hell. Well, do not be scared because those little red devils will not lead to your demise but rather they will walk you through the game and reward you, and make a devilish sound every time you activate the feature. Behind the reels we can see hell fire and on the reels the usual symbols we see in classic slots. There are 2 wild symbols in Double the Devil, a blue seven and a red seven. The red wild is worth mentioning separately because it can bring the highest payout 50.000 x your line stake, if you are playing with maximum credit. 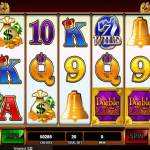 The main feature is the free spins round and it is activated by landing just 2 devil scatter symbols on adjacent reels. 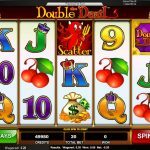 For which you will receive 5 free spins, but if you manage to land 3 you will get 10 free spins, for 4 you will get 20 free spins and for 5 devils you will get 60 free spins. It is possible to re-trigger the feature again but you cannot win the big prize within the feature unfortunately. Double the Devil is somehow a comic game even though it has a very serious theme as an inspiration. Well the people from Amaya did not want to scare you after all, but they wanted you to enjoy the game. And we indeed had an amazing gaming session playing Double the Devil. The game play is straightforward and the features are easily activated and the best part they are profitable too. So we believe that if you give it a chance you will enjoy it the same way we did. For another great game option you should consider playing Cubis a 5 reel slot by Amaya.